This chess set - the largest standard size we produce - has a 72" (6' tall) king. It is most often used for outdoor decoration, but can also be used for indoor decor. Play with it is also possible, on a board with minimum 24" x 24" squares, especially if you wish to develop your physical fitness along with mental! Very nice for outdoor decoration. Perfect for your garden and your backyard as decoration. You can also put it as decoration for outdoor party, adolescent chess game, college, hotel decor, and another occassion. 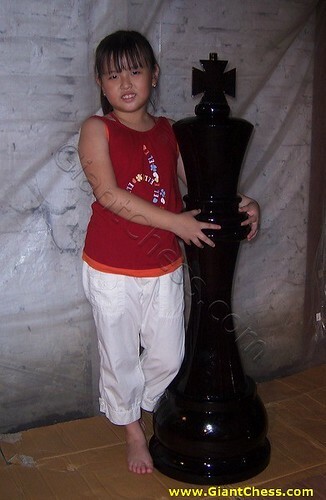 Get great and high quality of giant chess piece from us. We will give you best price for your order.